If your pet prefers a diet free of grains and ordinary proteins, put them on the path to nutritional nirvana with Infinia® ZenFood™ holistic pet food. ZenFood™Salmon & Sweet Potato Recipe offers you peace of mind with top-of-the-line, grain-free nutrition without ingredients like wheat, corn, soy, dairy, chicken or beef. 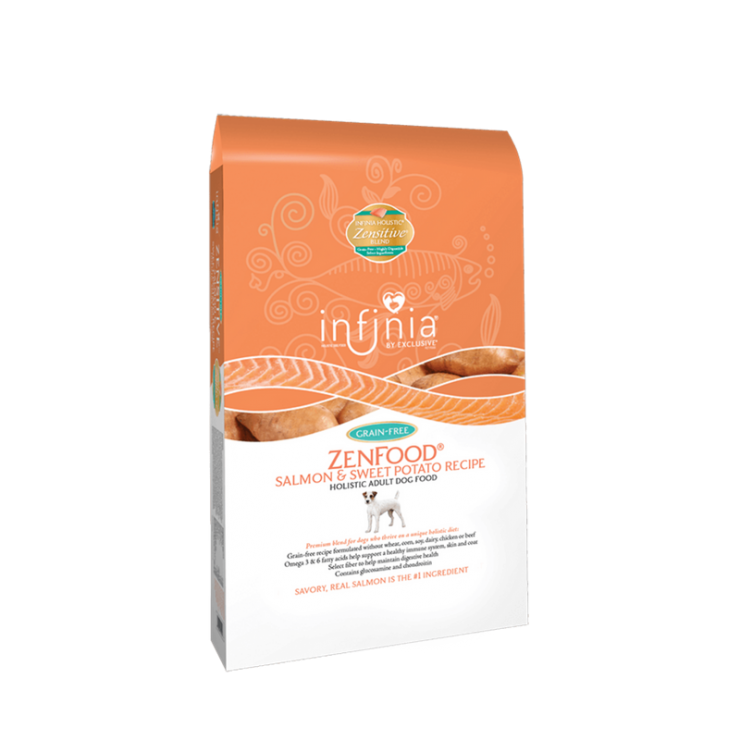 The Infinia Holistic™ ZenFood™ Blend is formulated with Omega 3 & 6 fatty acid and zinc for a full, shiny coat and supple skin. Your dog will enjoy a flavorful meal packed with select nutrients, and you’ll enjoy peace of mind. How will you know? Just look for that happy, wagging tail!